Puppies born to be wild, have fun and be naughty as dogs do. We breed Australian Terriers for people who like an active dog ,but they will adapt to any life style, they do need a firm hand with training but are very quick to learn.Our dogs are born on a working farm and chase sheep and cows, do all farm work like fencing or tractor work.We dont need an alarm clock as they wake us up at 4.30 every morning.Our dog are well loved and we like them to go to good homes.We are only a small breeder so we have quality and good temperment rather than quanity and we are not just in it for money. 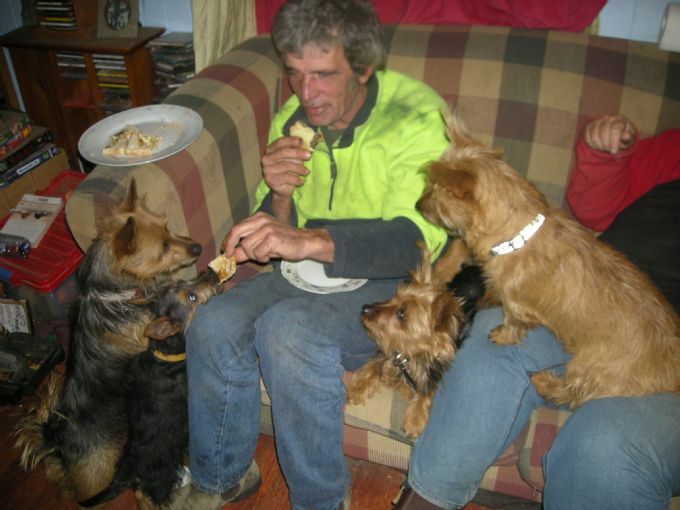 Top Photo Peter having vegamite toast but you must share,as sharing is caring.